Newberg battled tooth-and-nail with the defending Class 6A state champions, checking Southridge's every move, blocking balls and attacking the net with force. 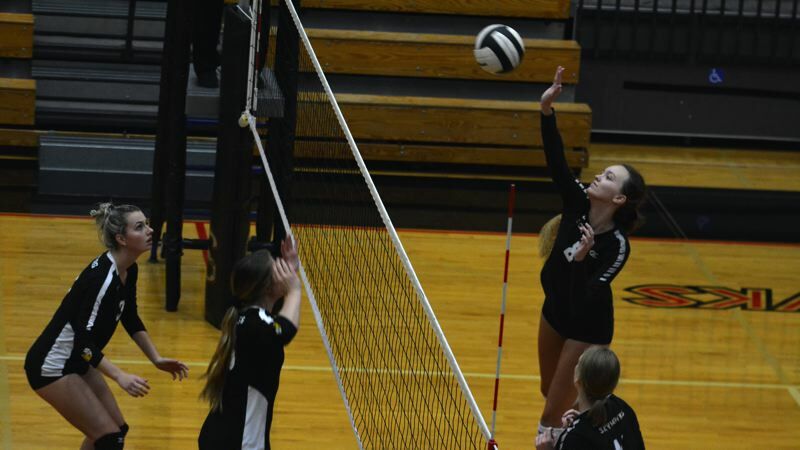 Tiger seniors Carly Cuddeford and Grace Kassebaum anchored the defense and dropped home aces. Senior outside hitter Giselle Benetti was unblockable at times high above the net. Newberg dropped the first set by just four points, the second set by two and roared to a 25-19 win in the third. A heroic comeback wasn't out of the question. But Lindsey Lambert and her Skyhawk teammates are a group that likes a challenging resistance. Push Southridge and the squad comes alive. And while No. 24 Newberg earned the respect of the champs with its spirited play, the No. 10 Skyhawks' moxie sent them to the second round with a 25-21, 25-23, 19-25, 25-19 win on Oct. 24 at Southridge High School. When it's win or go home in single-elimination play, it pays to have players on the floor like Lambert, Tedy Batinkova and Emma Jansen who have shown out in high-pressure moments before. "This team has a lot of heart and competitiveness," Lambert said. "Our effort has never been an issue with this team. You'll always see us diving on the ground and giving that full-out effort for every single ball. If you see people mad on the court, it's not because they're mad at their teammates, it's because they're mad at themselves because they know they can do better. People don't need to tell us to pick it up. We'll look inside ourselves and tell ourselves, which is a great quality to have as an athlete and a team player." 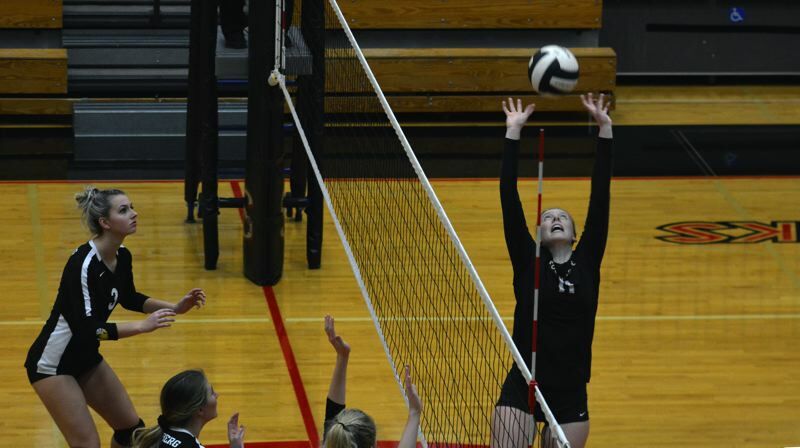 It was a far cry from when the Tigers were swept at home on opening night by the Skyhawks. The first round of the 6A volleyball playoffs was not a mismatch, but a high-level affair of two teams who looked and played much better than they did in late August. "The team never gave up and in fact, dug in and continued to improve as the match went on," Newberg head coach MacKenzie Upchurch said. Certainly, both teams put together extended stretches of play through the four sets that kept both sides of the stands engaged all game-long. The Tigers trailed just 20-19 in the first set as Benetti put away passes from Lauren Griswold and Kassebaum batted home an ace. Southridge shut down the first set with five of the final seven points with Lambert, Kendal Henry and Emily Bunnell leading the way. The Skyhawks led by as much as seven in the second set, only to commit seven errors late that allowed Newberg to tie it up 22-22. Lambert put home her patented lefty cloak and dagger kill to give Southridge a 23-22 lead, only to see Benetti hang in the air for an equalizing tip kill to tie it 23-23. However, Henry scored a tip kill off a Lambert assist. And with Lambert serving along the backline, Newberg's return went wide and out of bounds as the Skyhawks escaped with a 25-23 second set win. "Our intensity and heart really helped us break through those nerves and get us this win," Lambert said. "Our energy was super high the entire game and helped us push over and win this game." Newberg jumped out to a 10-2 lead and never relented in the third set, staving off the sweep and early extinction. Benetti was arguably at her best late in the third. As Southridge started to scratch back into contention, the Tiger senior outside hitter reeled off two monstrous kills from the left side and another slight of hand tip from the right side over two lunging Skyhawk defenders that gave Newberg a 24-19 lead. Both Benetti and Kassebaum rose to the challenge when called upon, something Upchurch admired as the seniors brought Newberg back. "Both Grace and Giselle have been our pillars all season on their respective ends of the court," Upchurch said. "They've been varsity players since their freshmen year and had a taste of playoffs in the past. After a couple years of restructuring, getting back into these types of situations was particularly rewarding. I've been most impressed with their leadership and accepting the roles given to them. Their level of play and commitment to the team has fostered a lot of trust and respect within the program." With a small, but boisterous student section having the Tigers' back, Newberg lived on thanks to some stellar work from the serving line that kept Southridge out of sorts. "We had to use serving as an offense," Upchurch said. "The girls bought into what I asked of them, and it worked." The Tigers hung tough in the fourth set, staying in stride with the Skyhawks as the two teams tied at 11-11 early. But Southridge swung the tide with an 8-0 run, highlighted by a huge two-handed slam block by Henry that seized a 19-11 edge. Newberg kept the fight, with a kill from Brynna Geibel and blocks from Tori Petersen that made it 24-19, but a Tiger error ended the match. Newberg ended its season at 11-11 and 6-6 in the Pacific Conference. It was the final game for Benetti, Kassebaum, Cuddeford and Moriah Reid. Southridge is 15-7 overall and finished fourth in the Metro League with a 7-5 mark. The Tigers will return the majority of their roster next year, giving Newberg something to build off of. "We are fortunate to have depth and girls that can play a variety of positions," Upchurch said. "While we will certainly miss the dedication and leadership of the seniors, the returners are already looking forward to contributing at a higher level next year. It's all about continuous improvement."